Please note there is limited space available for Corporate groups so please be sure to grab one fast! Email info@underthestars.in for more information on how to get involved. Professionals in London sleep rough for one night near the famous Tower Bridge in support of Action for Children. There are two categories of corporate registration. You can either register a group of up to 25 ppl or a group of up to 15 ppl to participate in Under The Stars. Both categories will be provided with a reserved space and group entertainment throughout the evening. The corporate team of up to 25 ppl is required to donate a minimum of Rs.40,000/- of which Rs.15,000/- must go to the common pool to be distributed equally to all our NGO partners. The remaining Rs.25,000/- can go towards one of our NGO partners of your choosing. If you are registering a corporate team of up to 15 ppl then you are required to donate a minimum of Rs.25,000/- . Rs.15,000/- will go to your chosen NGO and Rs.10,000/- to the common pool. Please visit this page for more details on the NGOs you can sponsor for this event. The causes we are partnered with are registered and are highly reputable charitable organisations working in the areas of poverty alleviation; shelter for vulnerable children or the disabled, health support for the impoverished and education. The event will serve not only as a chance for your employees to take on a meaningful and unique challenge for a social cause it is also a feel good exercise and an opportunity for team building. 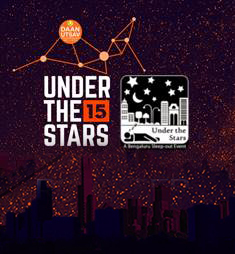 Under The Stars promises to be widely publicised and as one of our Corporate partners your involvement will be mentioned in all our communications with the media in the lead up and aftermath of the event. Be an activist, make a statement, be a part of something bigger this Joy of Giving Week…. contact info@underthestars.in to arrange the registration of your Corporate team.